The setting is Pemberley, Ohio during the Christmas season, and something electric could happen, as long as the characters can't get over their hang-ups and give in to the magic of the mistletoe. Darcy Fitzwilliam is a 29-year-old brilliant, successful and beautiful woman. She dates hedge fund managers and basketball stars, and always has her three cellphones buzzing. 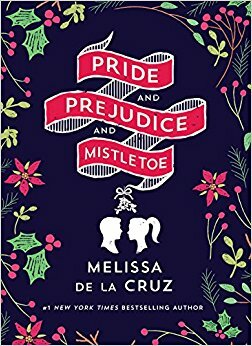 de la Crux writes of Darcy, "When, from time to time, she had a few spare hours to analyze and assess her life, she would realize that it wasn't that she didn't ever care to settle down and get married; it was that she had less than zero interest in doing these things with someone who didn't make her absolutely melt. The way Darcy saw it, she'd have real passionate love or she would have none at all. Of course she preferred the thought of the former, but without it, she was prepared to settle on the latter. Anybody who perceived Darcy as coldhearted and callous had misunderstood her. The truth was that beneath her cool exterior was a very warm, very willing heart, waiting patiently to give itself to the right person. She just hadn't found him yet." Typically not one to go home for Christmas, Darcy had never fallen in love and never has time for anyone else's drama. When her mother falls ill, Darcy feels obligated to come home to Pemberley to spend Christmas with her family. At her family's annual Christmas bash, Darcy meets Luke Bennet, the smart, sardonic slacker son of their neighbor. Luke is 32 years old, has never left home, and he works as a carpenter who makes beautiful furniture and is content with his simple life. He comes from a family of five brothers, each one less ambitious than the other. After they get acquainted, the question is can Darcy fall in love, or will her pride and his prejudice against big-city girls stand in their way? Melissa de la Cruz has written some amazing bestselling and beloved novels, including The Isle of the Lost, the prequel to Disney's Descendants novels, Alex and Eliza, the Blue Bloods series, and Witches of East End. "It should come as no surprise that I am an Austenite," says de la Cruz. "But I was inspired to write this after reading Curtis Sittenfeld's terrific novel, Eligible. If my book is even as ounce as fun as hers, I feel I have succeeded." The film adaptation is currently in development with Brad Krevoy Television, with de la Cruz writing the screenplay.